Steel 1-place personal watercraft trailer. 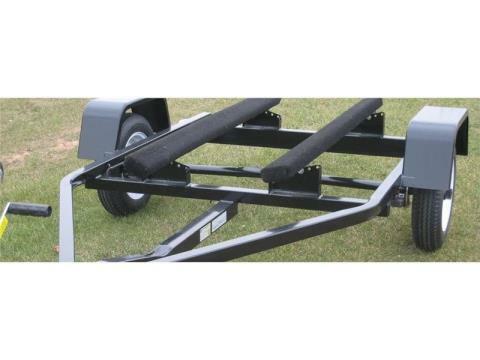 Chilton personal watercraft trailers are built of heavy-duty tubular steel to give you the confidence you need when moving your watercraft to and from the water. The PW series trailers are designed and built to be lower slung to allow for easier boarding and trailering of today’s larger power watercraft. PW trailers are available in either a 1-place or 2-place model and have a carrying capacity of either 900 lbs. or 2,270 lbs. respectively. Standard features include adjustable bunks with marine grade carpeting, Dexter EZ Lube axles, DOT compliant (sealed) lighting, and heavy-duty safety chains and hooks. 4.80 x 12 LR "B"